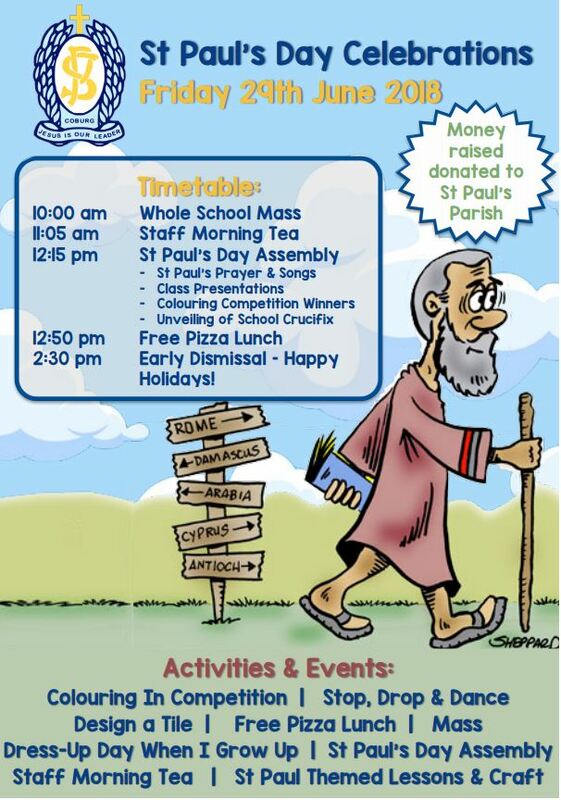 St Paul’s Day Celebration is a highlight in the school calender when our school community celebrates the Feast Day of St Paul. Saint Paul is one of the most important and influential of all the saints and many of his writings are contained in the Bible. He was seen as a leader and his legacy of faith, courage and commitment is still used to inspire us today. Paul’s writings in particular are important because they provide good advice on how we can live in peace and hope. Highlights of the day include a whole school mass, special St Paul’s assembly, free pizza lunch for students, design-a- tile craft, colouring competitions and unveiling of a school crucifix, proving to be an exciting day of celebration for our students. Parents are welcome to attend mass at 10.00am and assembly at 12.15pm.